a small number of visitors to your website may not be able to see all the colors used in your designs. insufficient contrast between your background and foreground colors could make it harder to read the text in your web pages. 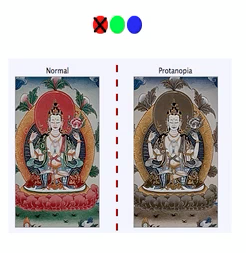 Protanopia and protanomaly: people with these conditions are unable to see the color red well. Colors on the red-green end of the spectrum will tend to shift toward beige and gray for people with these conditions. 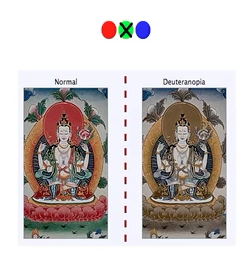 Deuteranopia and deuteranomaly: people with these conditions are unable to see the color green well. Colors on the red-green end of the spectrum will tend to shift toward beige and gray for people with these conditions. Deuteranomaly is the most common form of color blindness, affecting about 6% of all males. 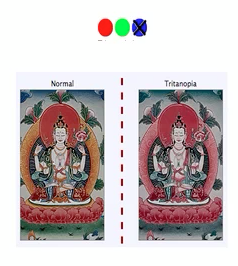 Tritanopia: people with this condition are unable to see the color blue correctly. As a result, colors on the blue-yellow end of the spectrum will tend to shift toward red. This type of color blindness is relatively rare. A person with red-green color blindness may not be able to perceive that information. A better solution is to include the actual words “required” next to each required field, or to use bold text or another indicator that helps the text stand out. Another issue related to color on the Web is the contrast ratio between the background and foreground colors. Insufficient contrast can make it more difficult to read the text on a web page or identify important information in images. The Web Content Accessibility Guidelines, in version 2.0, require a contrast ratio of 4.5 to 1 for the background and foreground colors. For large text (anything larger than 18 point) the requirement is a contrast ratio of 3 to 1. The only exceptions to these requirements are decorative images that do not serve any kind of interface function (they are not part of the navigation) or text that is included in a logo. Color simulations are Copyright (c) WebAIM.